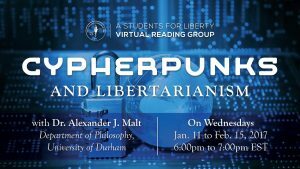 Join our new “Cypherpunks and Libertarianism” Virtual Reading Group! The late 80s and early 90s saw the creation of the internet, and during these early years a group of programmers, cryptographers, hackers, and activists came together online to outline how this technology had the potential to realize a radically different political order. These were the cypherpunks, and their vision was ‘crypto-anarchy’: a world where nation-states were stripped of their power to coerce, as cryptography would prevent them from ever knowing who they should be coercing. You might have noticed something: this has not happened. The creation of the internet has already raised significant challenges both to libertarians (who are now, post-Snowden, aware of the extent of the surveillance state) and to the state itself (which is trying to understand how to regulate new technologies and structures such as cryptography, cryptocurrency, and distributed autonomous organizations). But so far we have only witnessed the early effects of the internet-of-information; since 2008, the world has seen the start of the internet-of-value and the internet-of-things, which also promise radical transformations. 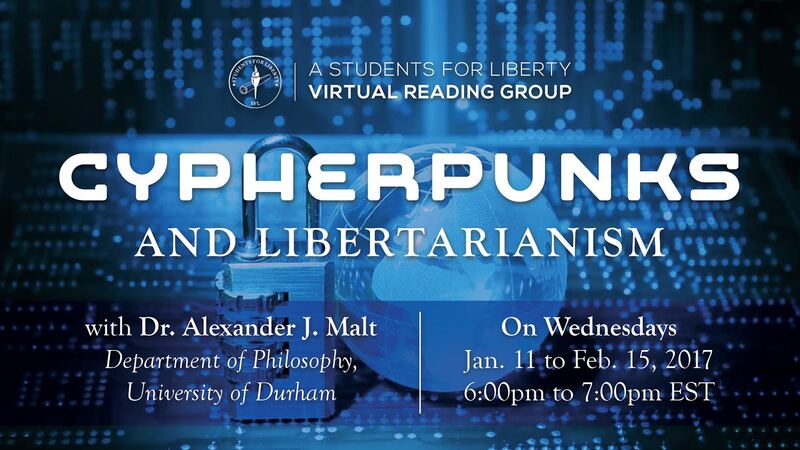 Our new Virtual Reading Group, “Cypherpunks and Libertarianism,“ aims to explore the links between the cypherpunks and the liberty movement in a variety of areas. Participants will explore how cryptography can challenge state power, the future of intellectual property, social orders in cyberspace, freedom of speech in the context of computer code, and much more! The deadline for applications is January 6th 2017. This VRG has now concluded.